Earn points toward the purchase of your next Ken Shaw Toyota vehicle by getting your service completed at Ken Shaw Toyota. You'll earn 10% of what you spend in Service and Parts, 2% of what you and/or your insurance provider spends in our on-site Collision Body Shop Repair shop towards your next vehicle purchase. Refer a new customer to us, and we'll reward you by adding $100 to your Rewards Account to take off the purchase of your next vehicle! It's FREE to join, so speak to our Service Advisors or Sales & Leasing Consultants today. 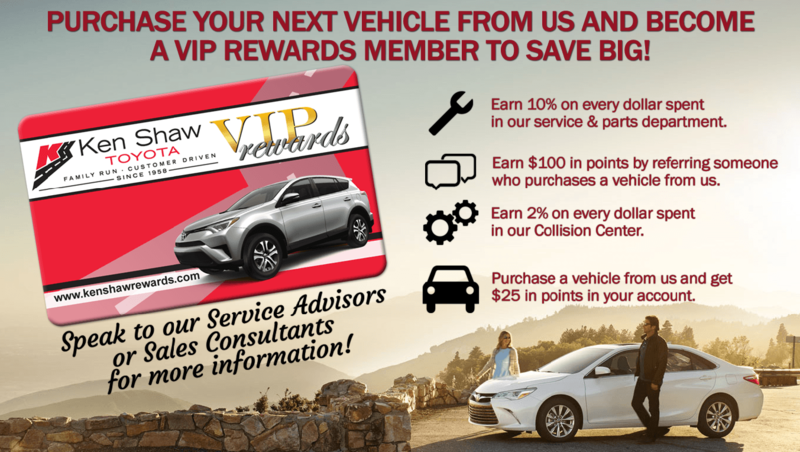 Purchase your next vehicle from Ken Shaw Toyota and become a VIP Rewards member of this exclusive club. VIP Members save BIG.